On a scale of 1 to 10 I would give this weekend’s garage sales experience a solid 5. I think the hotter it gets outside the less quality sales I am going to find. And it was HOT on Friday. At 10:00 am it was 85 and just getting hotter. 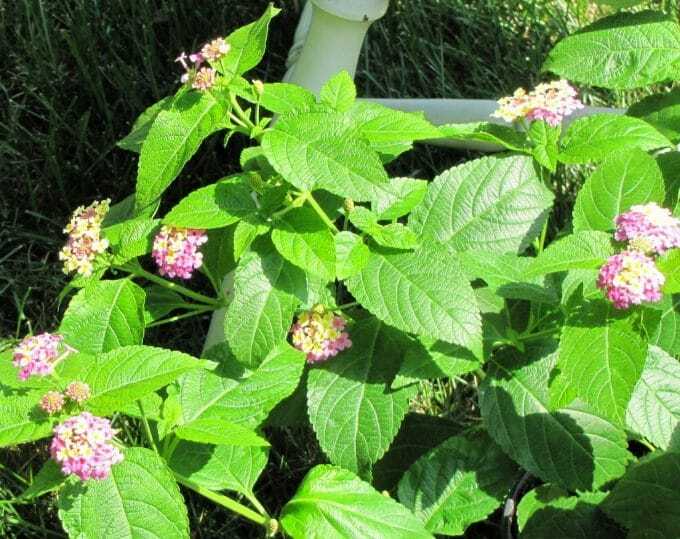 It topped out in the mid 90’s with a heat index of 100 degrees. The highlight of my scorching search today was these six wooden folding chairs. I found them at a barn sale that had some neat stuff. Each chair was $5.00, so $30.00 for all of them. 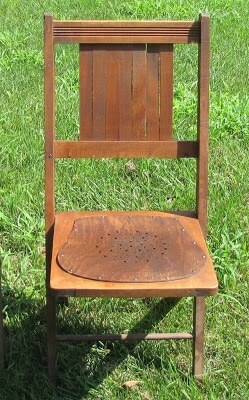 Now I really don’t need another folding wooden chair, but it’s been sort of my theme this summer. I keep coming across them and I have to buy them. These ones were a little different because they have wooden seats with holes in them. From afar I thought maybe they were leather seats like you see on some antique chairs, but nope they are wooden. I guess the holes are for air circulation? Let’s not think about that theory too much or we will start imagining how many behinds have sat in these things over the years. They all had the same tag on the bottom from a department store in Indiana. Thankfully they don’t have a funeral home name on them because then that whole funeral vibe would be haunting me (pun intended). So please don’t tell me the department store would have donated them to the funeral home as a quirky advertising gimmick because then I would have to find a new home for them real quick. Seriously, I went antiquing with my sister one day and it happened to be in the same house that used to be the funeral home in my home town. Talk about creepy. The combination of antiques, which for the most part are dead people’s stuff, and a funeral home was too weird for me. She bought a very nice Jenny Lind bed from the basement area where they used to embalm people. Not that they embalmed people on the bed, but that’s the part of the store that we found the bed in. She was fine with the bed though – just turned out to be a nice bed with no weird ghost stories to tell about it. Anyhow back to the point, here are some of my other finds. 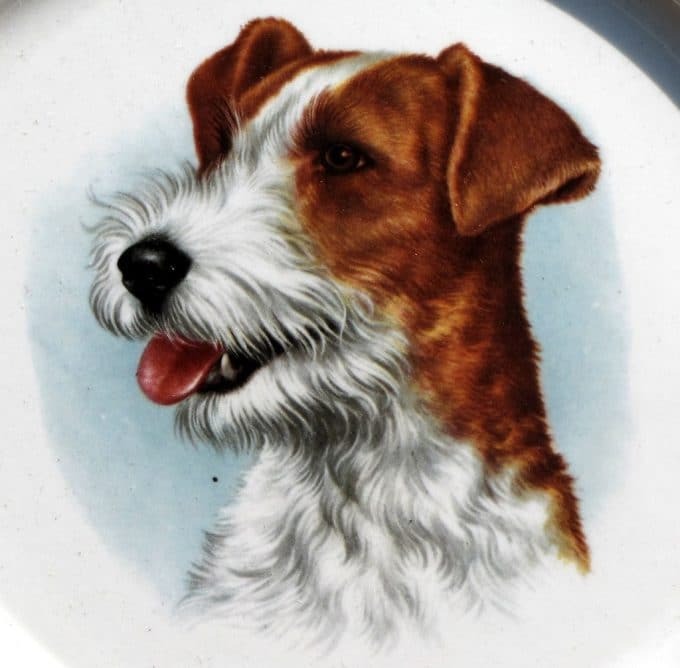 A cute dog plate for 50 cents (it doesn’t have a defect in the upper left hand corner of the plate, that’s just remnants of the price tag). Isn’t he cute? A schnauzer maybe? Or a Terrier? 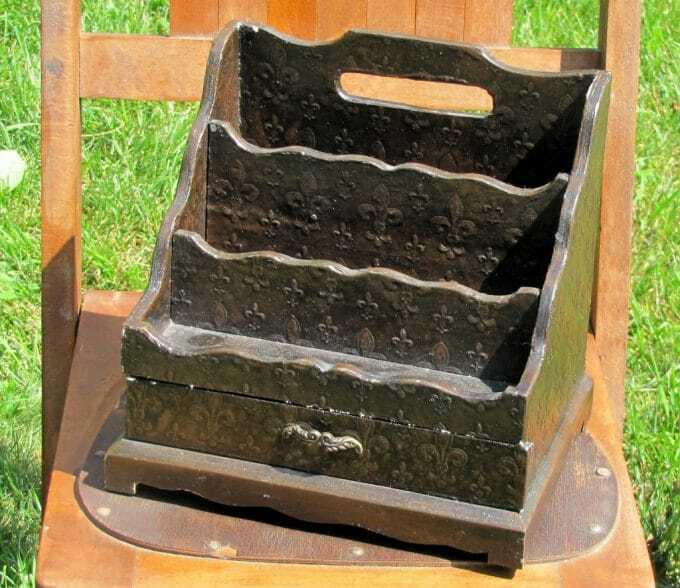 This desk organizer is very much not an antique, but it was only $1.00 and I need something to organize mail in my kitchen. 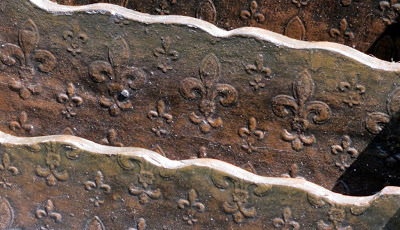 It has an embossed fleur de lis design on it. It is a dark brown now so I will either paint it black or white depending on my mood later today. 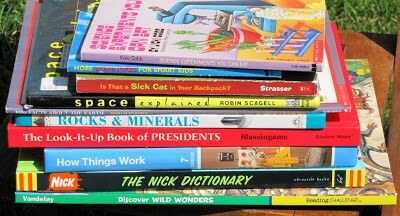 I bought a ton of books for my son for 20 cents each. I always pick up educational books for him when I can. 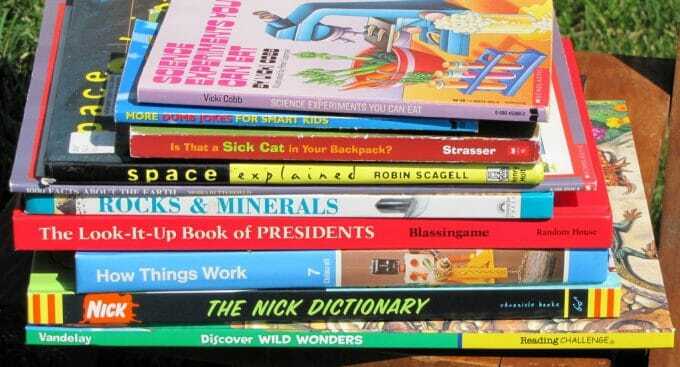 And I am sure the Nick(elodeon) Dictionary with a picture of Spongebob on the cover is strictly educational. 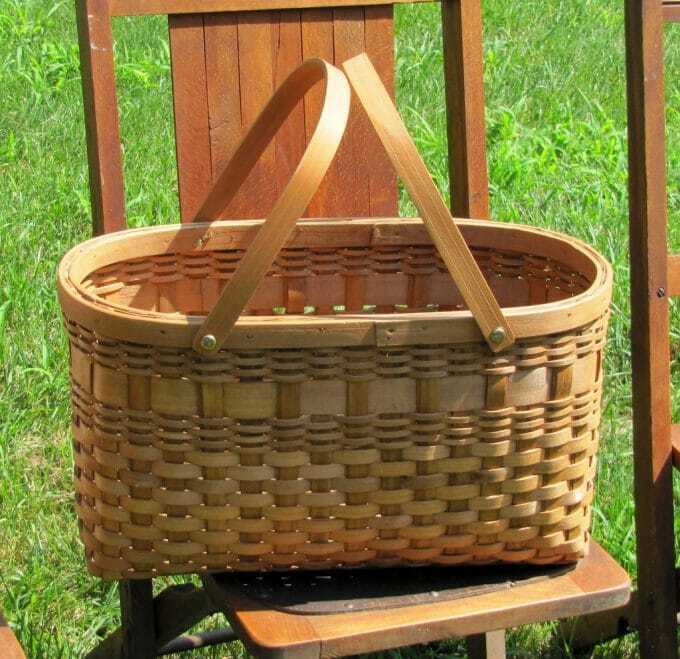 This basket was a deal at $1.00. It is a perfect size to put in my office to throw magazines in. 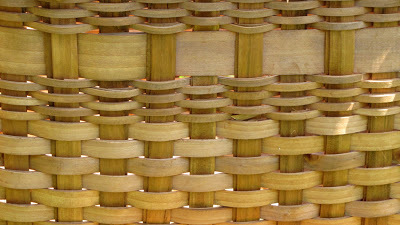 It is not a Longaberger, but it is well made. I also bought two boxes full of canning jars. 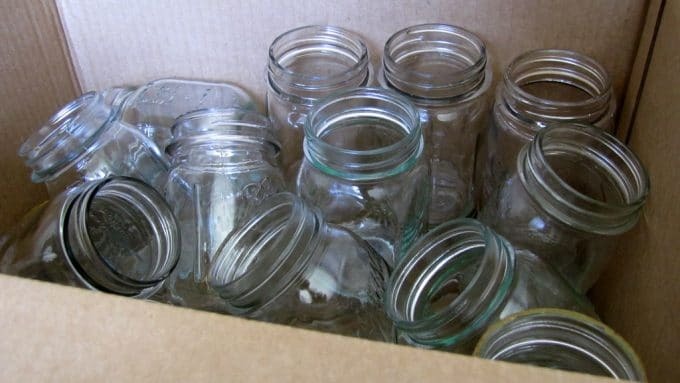 There are many different brands – Ball, Atlas, Kerr, Mom’s, Drey’s and some that just say Mason Jar with a star between the word Mason and Jar. There are many different versions of each brand also, so I might have to do some research to see which are collectible and which ones I will just use for projects around the house. Or to can food if I get adventurous. 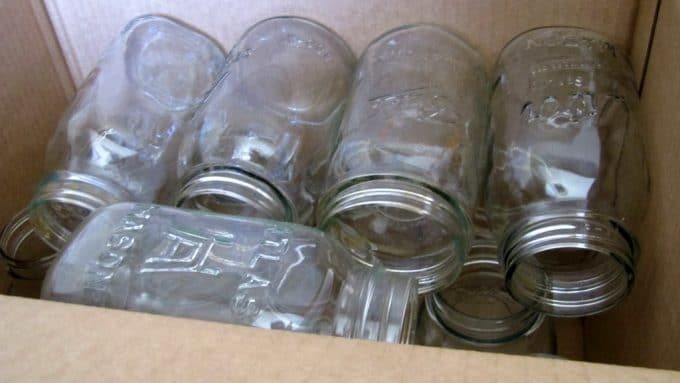 I bought 17 quart and 34 pint ones for $8.00. My favorite buy of the day was not a garage sale find though . 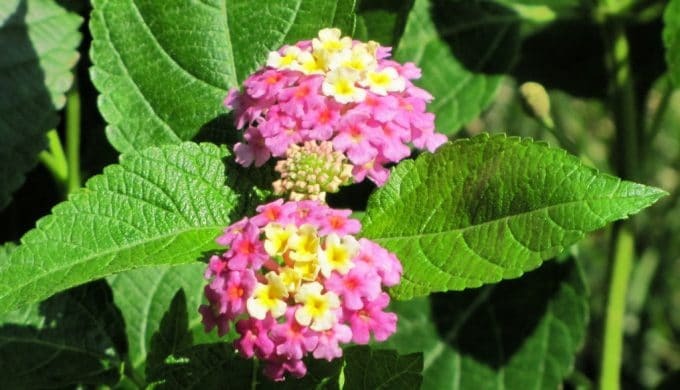 It was some lantana (Lantana Camara) from Home Depot for $2.99 each. I am going to use it to fill in some flower pots where some of the flowers have gotten too leggy. 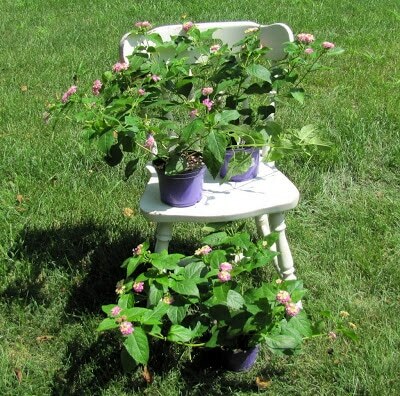 Now those “COOL” old chairs get a 10 for sure…$5 is such a great price for these goodies! Nice finds. How about this. The department store used them for special occaisions like bridal shows. Hi Pam~ just hopped over from Debbiedoos! 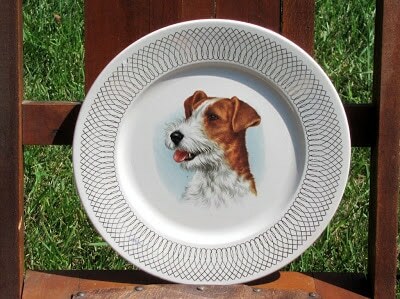 Love your finds, especially the wonderful chairs and the cute dog plate! I’m looking forward to reading more…I am a new follower! I would say that you had a great week saling, Pam! One good thing about folding chairs is they don’t take up much storage space. Love your letter organizer…can’t wait to see it repainted. Great finds! 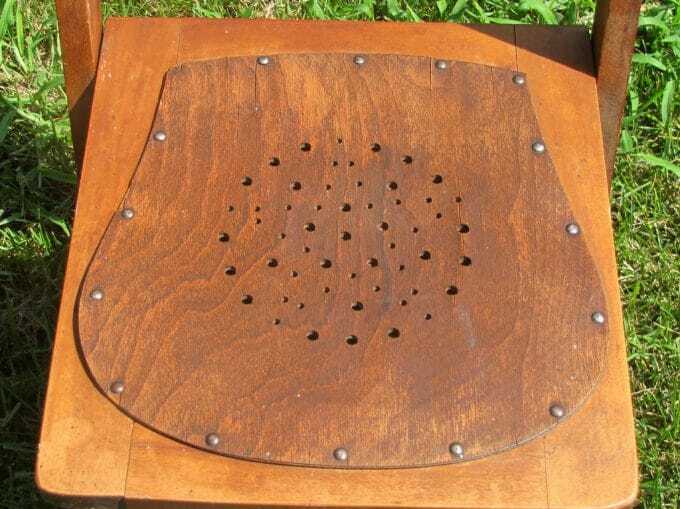 Cool old chairs! 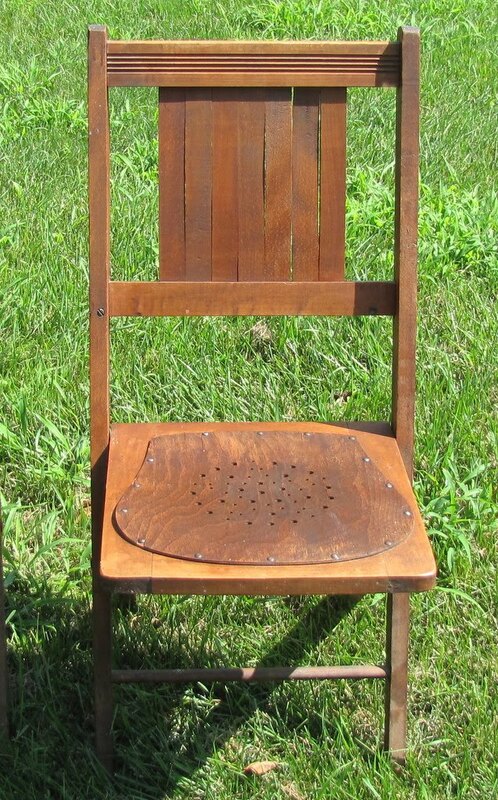 The old town hall in the teeny town I grew up in had those wooden folding chairs with the holes in the seat. How funny! I would have loved to find some like that. I wouldn’t have minded if they were from a funeral home..LOL…I love creepy stuff like that!!!! 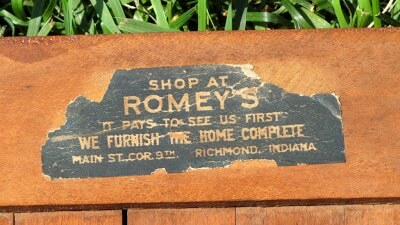 Our antique sideboard was made by a company in Batesville, IN that also made coffins, besides dining room furniture! Congrats on all of your great finds!! I love it ALL! Awesome finds!!!! Love the desk organizer!!! Stopping by from debbiedoos! Love your finds. The chairs are just great and I love the organizer! I love all the bottles. Great display pieces for buttons, ribbons, seashells and more. Congrats on a great weekend. You got lots of great deals. Love the chairs and what deal. Love the dog plate, too. Wow I love the folding chairs! What a great deal. And I love the Fleur De Lis storage bin. 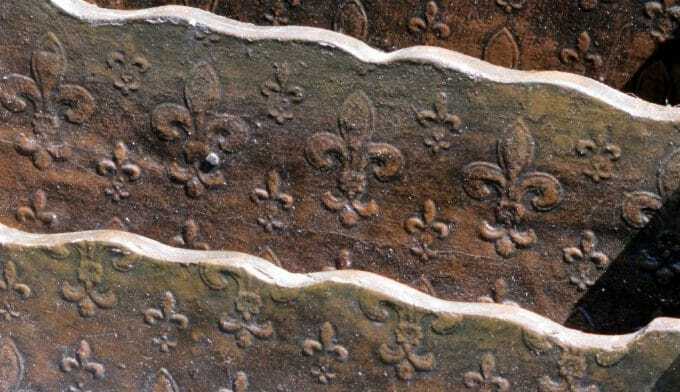 I’m from Louisiana so I’m partial to Fleur De Lis! The dog is a fox terrier. Very good rendition of one on that plate. Enjoy all your treasures – I love the folding chairs. You don’t often find folding chairs with such style. Those chairs are great and you got quite the deal on them! Thanks for the web site. I’m going to go check it out. I love the chairs….what a great find! My guess for your pup plate is Jack Russell terrier, just a guess. 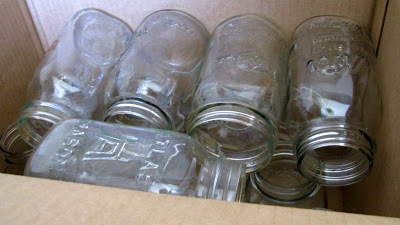 I might be most excited about the mixed canning jars, I want to see a mason jar with the star-have fun! 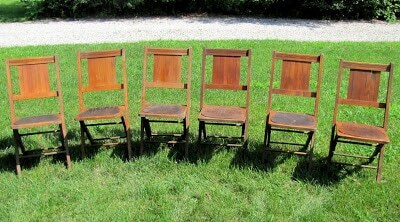 I also love those wood chairs and I would give this a good 8!! 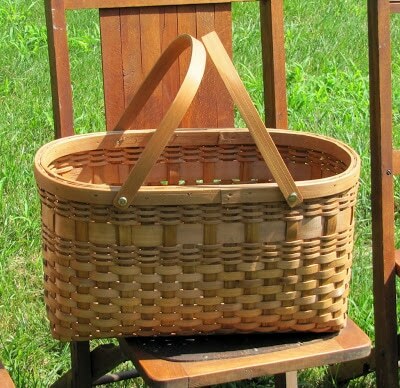 The basket is cute and seems like a good price for all the jars. Wow, you got some good finds. The organizer is really interesting.